There are not too many places that have tram (light rail) stops that are exciting designs. Most are functional and are usually simply places marked where you stand to catch the tram. I remember being very impressed with some of the Metro stops in Los Angeles and Pasadena – some being designed for the location and many have public artworks that reflected the locality. At some stops in Melbourne you can find yourself in the middle of the road with traffic wizzing past on both sides – and getting to these stops means crossing busy streets. Melbourne trams are fabulous – but their tram stops can vary a lot in the experience they provide. The new stops in Canberra will mostly be on green spaces down the centre of the streets – so traffic should not be a problem – which means there is scope to be adventurous with the design. Of course Canberra did have those iconic concrete cylinders for bus stops – some still exist but I think they are gradually being taken out. We got used to them and can now appreciate that they had more character that the standard metal and glass bus shelters that have been replacing them. 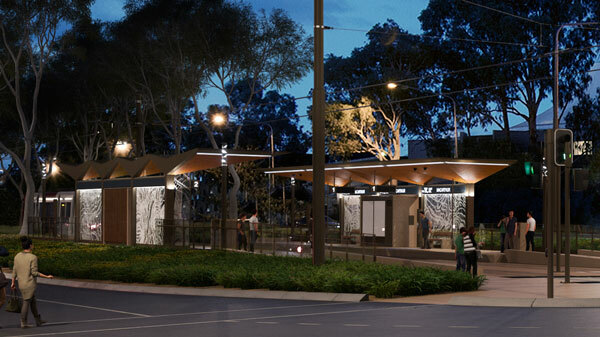 Last week the ACT Government announced that it was asking for feedback on the design for the twelve tram stops from Gungahlin to Braddon. Having read the article and done my best to interpret all the stuff on the NCA’s website – I think this means that it is to be the same design for all of these stops – presuming there is something different for Civic (yet to be disclosed). If so, that puts a lot of significance on the design of these pieces of very visible infrastructure. 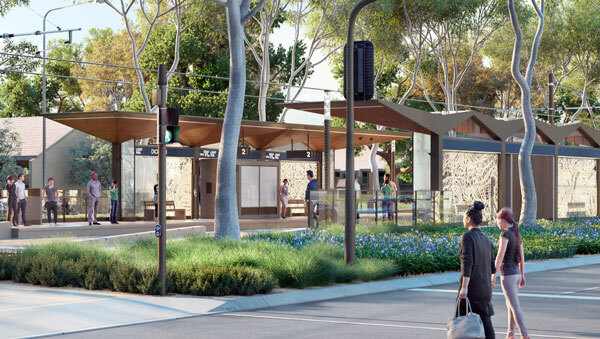 It is going to be very important that they are designed as part of the entrance to Canberra along Northbourne – being a main entrance point to the National Capital. And if they are to be seen all the way from Gungahlin to Braddon, the design should be something very distinctive that should become something that locals get to be proud of and visitors admire and take that photo to send onto others. And just to be pedantic: The images as provided include lots of fully grown trees that soften the viewing of the design for the tram stops. The reality will be that those new trees will be much smaller for many years. 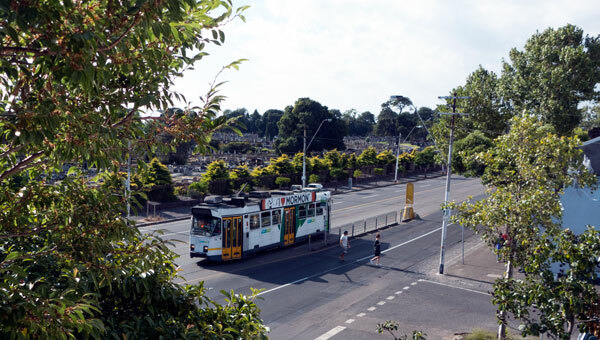 The tram stops will be very visible and very dominant for the decade as the trees mature to be as shown in these images. This is even more reason that the design has to be something special – not ordinary. 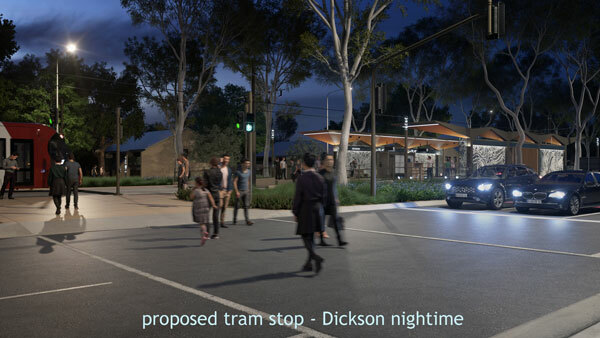 Below is a couple of the images of the designs – plus I have cropped and blown up the image to provide a clearer look at the proposed tram stop. My reaction? They are not very interesting – in fact, they look very ordinary – not exciting – very bureaucratic basic – not something iconic or innovative – not something that says Canberra the bush capital – nor something that would become a subject for tourist photos. They look as though they could be from any city – with nothing obvious that makes them local or even Australian. The artist-designed panels look good (I am guessing from what I can see) but they do little for the overall design of these shelters. The present design will provide very little protection during bad weather. This fault will discourage people from catching the tram on days of inclement weather. There is ample room for better shelter arrangements than has been provided by the design as published. Again – when you take away the tall trees – they are nothing special. 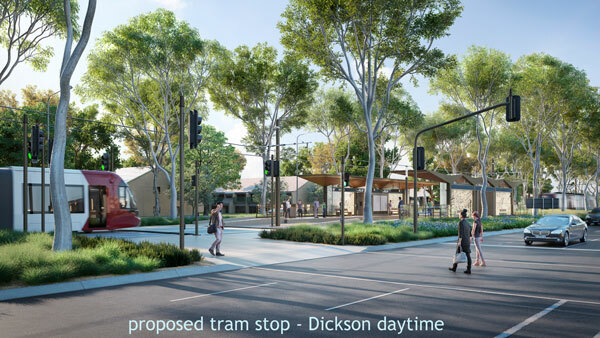 I think we can do a lot better for something that will be a very significant part of the new tram line along the new Northbourne Avenue into the nation’s capital as well as being repeated all the way to Gungahlin. I do urge you to make your own comment on this design. Make a comment here on RiotACT and/or to go online to the NCA’s site where they have all the documentation – plus an email to use to lodge your comments. 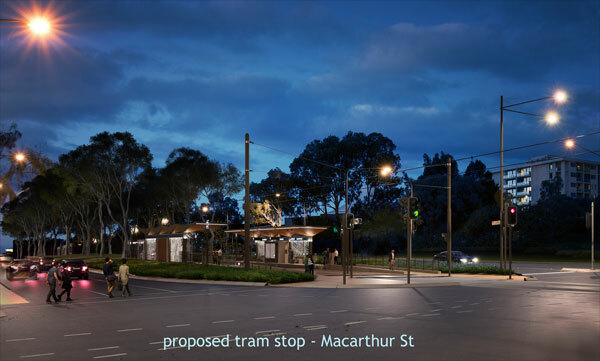 This new tram stop design for the twelve stops is open for comment until 2 June 2017. I look forward to seeing your feedback to this post. New you could be counted on to link to that story. The fact it is from the hearald sun says a lot really. And ps a bus and truck colliding would produce much the same result. But is wasn’t a bus, it was a tram. The point I was making was that the tram shelters should be made to avoid vehicular traffic. Also, tram shelters in the USA are attracting crime likes moths to a light http://www.aei.org/publication/whod-a-thunk-it-like-most-central-planning-public-transit-systems-often-fail-without-massive-taxpayer-subsidies/ so I assume there are panic buttons and 24/7 surveillance linked to a police station in the ones we are getting? A post like the OP’s. lots of criticism, but no suggestion on how it could be better. And I am not a surprised considering your anti ACT Labor stance, you wouldn’t be happy with anything they did. I’m not an architect or a designer. But im a daily user of public transport – ACTION buses. I know what will work for users in terms of bus/tram stop design. That design is a croc. But, as usual when there is criticism on here about the ACT Labor/Greens Gov’t, certain posters leap to their defence – if only passively. As Dungfungus observed recently, this forum is nowvery “left”. Talk about missing the point. You don’t need to be an architect to look or understand the plans. They show detail that are not seen on the pretty pictures on this site. Detail like the wind blocks and all the other things that are attracting criticism here. But yeah too much for the right to seek out facts. They like headlines and jump to their own, usually wrong conclusion from that. Those trees in the artist’s impressions seem to have spiralling trunks. I haven’t seen eucalypti like that before. Must be the E.Screwu. And where are the bicycle shelters? Come in Pedal Power, over. I’m not an architect or a designer. But im a daily user of public transport – ACTION buses. I know what will work for users in terms of bus/tram stop design. That design is a croc. As i recall, are not the tram stops part of the infrastructure to be provided/paid for by the ACT Gov’t/ACT Ratepayers ? If so, then the design must be the ACT Govt’s. That would explain the blandness and non functionality I suppose. Aesthetically : Yuck . But i accept that beauty is in the eye of the beholder. Seems to be very complementary to the design & blandness of other ACT building designs, so probably will fit in well. What did anyone expect, “hopes/opportunities” aside. Functionality ? As if that design will reduce wind impact and keep tram passengers dry in rain. As with the appalling design & functionality of the new “advertising” ACTION bus shelters, you have no hope. I wonder what the chances are of a vehicle running off Northborne Ave and crashing into a flimsy shelter ? In due course, they will probably put some of those anti crash barriers up between Northborne Ave and the tram stop – that will certainly improve the aesthetics !. . Curious if any of you lot (including the OP) who are whinging about these shelters has actually bothered to look at the actual plans rather than coming here to foam at the mouth. From a practicality view point apart from fully enclosing them cannot see how they could be any more protected. And enclosing introduces a heap of social and safety issues. Which is one of the reasons the enclosed waiting rooms were closed/removed from the old Belconnen and City interchanges. I’m not too fussed about whether the stops are funky looking – more concerned about how the pedestrian crossings at each stop will be timed, how much advertising will be allowed, how well they will be lit, whether they are pram, bicycle and disabled-friendly, and whether they will be weather proofed. The most important feature of these stops will be their usefulness to light rail patrons, given that “ACT Labor has committed to increasing the public transport share of all work trips to 10.5% by 2016 and 16% by 2026,” and by 2014 had reduced the share to 7.1%. I wonder what the chances are of a vehicle running off Northborne Ave and crashing into a flimsy shelter ? In due course, they will probably put some of those anti crash barriers up between Northborne Ave and the tram stop – that will certainly improve the aesthetics !. . If you’re sitting in a concrete shelter, you can’t see anyone approaching and road users can’t see inside. There are minor consequences (they were often used as urinals or slept in by homeless people) and major ones (serious crimes such as assault are not visible from the road). The simple solution to this is to make the walls transparent, but that has its own problems. The present bus stop designs are very prone to vandalism due to the glass construction. They can be easily broken, evident by the continual replacement of the panels on the bus stop nearest our home. I’ve queried the glaziers when they have been replacing the damaged sections, as to why Lexan isn’t being used as a substitute. They claim that it is no better due to being flammable, which appeals to the firebugs of the nation. So we need to find a suitable alternative or take action to apprehend these culprits before providing additional sources of enjoyment for their chosen hobby. On another note, has anybody else noticed the error in the photo-shopping where the traffic light stands? It has a pole situated behind it, yet the pole obscures the green light in front of it. Oops! I would hope that the stops are functional as well as being well designed and vandal proof. Having areas that are heated, on timers, and wind proof will make them more attractive to patrons who have this amenity in their cars. I see, no “negative ” comments about the tram anymore. Just because the government pushed on with it doesn’t mean we have to accept it without reminding them they have made a dreadful mistake. Riotact is just becoming another mouthpiece for ACT Labor. 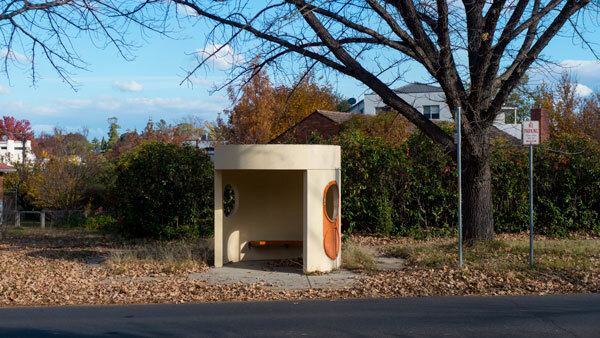 But the best bus shelters in Canberra for ‘actual passengers’ are the cylindrical concrete ones. It’s important to note Damien’s point above about passive surveillance. If you’re sitting in a concrete shelter, you can’t see anyone approaching and road users can’t see inside. There are minor consequences (they were often used as urinals or slept in by homeless people) and major ones (serious crimes such as assault are not visible from the road). Commuters only on public transport in peak times may not appreciate this but the more open shelters do feel safer later at night. A key value propostion for light rail is going to be for passengers along the corridor to use it at night, rather than just commuting. They want you to say “we’re going to a dinner and it is easier to take the tram than to drive”. I think they’re quite attractive. They’re clearly designed to be reminiscent of trees, at least as far as that is possible given necessary compromises for cost and durability. That seems like a deliberate design effort to fit the “bush capital” feel. I fully agree Miz, just like the stops in Civic they will offer little to no protection from the elements. What is with the upside down umbrella shape? It is so tall that with sufficient breeze to propel the droplets at a 45 degree angle, you will get wet pants. There doesn’t appear to be any walls on either end, so there is no place to escape the icy winter blast from the Brindabellas. I give it a 2/10 for function. The design looks utterly useless as a shelter. As a PT user I truly don’t care if they look cool or are reminiscent of the undulating Brindies, I would just like shelters to do their actual job and shelter you while you are awaiting your trip. We have serious heat, cold and blasting hot and cold winds here. This design looks utterly useless. There are no trees along Northbourne anymore and the ones they intend to plant are not good for shade. Similarly, the ‘ad shel’ bus shelters are next to useless – they don’t keep out much of the hot sun, wind or rain because their primary purpose is to be an ad stand – god forbid anyone block the ad by standing in front of it. The old heritage ones were a lot better (and it was galling that the lovely heritage ones were removed from National Circuit and replaced with crap ad shells a few years ago). I agree the tram stops are not very inspiring at all. I think from a practical point of view there is very little shelter or wind breaks in the design. I was thinking a more curve approach would be nicer, and the structure that springs to mind is the Melbourne rectangular stadium roof. Obviously on a smaller scale, but it kind of pays homage to the old bus shelters, or perhaps something like a series of curved seating areas almost like several bus shelters together. Just my thoughts and opinion, but these look very open and very bland and failing to see how they are even remotely practical in Canberra.